As introduced in 1.3 Supporting learning, online materials are usually viewed independently by students and prior to face-to-face sessions. Resources may also need to be accessed by colleagues supporting students or external examiners. Therefore, they must be usable without the need for a face-to-face guide. As most Yorkshare sites will start with an Announcements page, it is the left menu that will be the first step in navigation. From there, the folders and items within content areas will need to guide students to the content they need to prepare for taught sessions, complete activities or undertake assignments. Each provides an opportunity for clear sign-posting: leading your students from one piece of content to the next. Clear labelling of links with familiar words. Instructional directions to lead through the content. Clear labelling and instructional directions enable users visiting the site to know where and when to look for content and why materials should be used. Users with screen reading software will also know exactly what is contained within the site and be able to navigate their way around effectively, improving accessibility. Your site will also be usable by another colleague without having extensive knowledge of the module itself, for example an academic supervisor, disability support staff or an external examiner. Links should enable students to guide themselves through your module site. Whether you are creating links in the Left Menu or titling Items within Content Areas, use words that students will be familiar with across the taught programme. Students will be expecting labels such as ‘Reading List’, ‘Assessment’, ‘Lectures’ and ‘Seminars’ or ‘Labs’. You will need to be consistent with your colleagues. For example, if your academic supervision sessions are referred to a tutorials, ensure that this is not the same terminology used to describe small group problem-solving classes. If you require students to look at specific pieces of content, you should direct them to it. For example, a link to a PDF book chapter requires an instruction for students to read that PDF. This helps contextualise the resources made available, making explicit your expectations rather than expecting the student to second-guess what the requirements of the course are. Instructional directions are even more important for activities using online tools or activities which are not connected to face-to-face sessions. Further detail on instructional directions is in 5.1 Instructional writing. Most Yorkshare sites will use Announcements at the first page. This is appropriate for bringing current information to students attention. Before the module starts however, there should be, as a minimum, an introduction Announcement that welcomes students to the module and directs them to any content they should look at before the first taught session. Welcome to the module. This is a single-term module with a weekly lecture and a weekly seminar. Lecture materials will be posted online in the ‘Lectures’ section at least three days before the lecture. Handouts will not be provided in lectures, so you are welcome to bring your own devices or print out as you prefer. The seminar material will be available from Week 2 in the ‘Seminars’ section.In preparation for the first lecture, please take a look at the video linked for the Week 2 lecture to give you an idea of the sorts of challenges to be considered when looking at technology-enhanced learning. 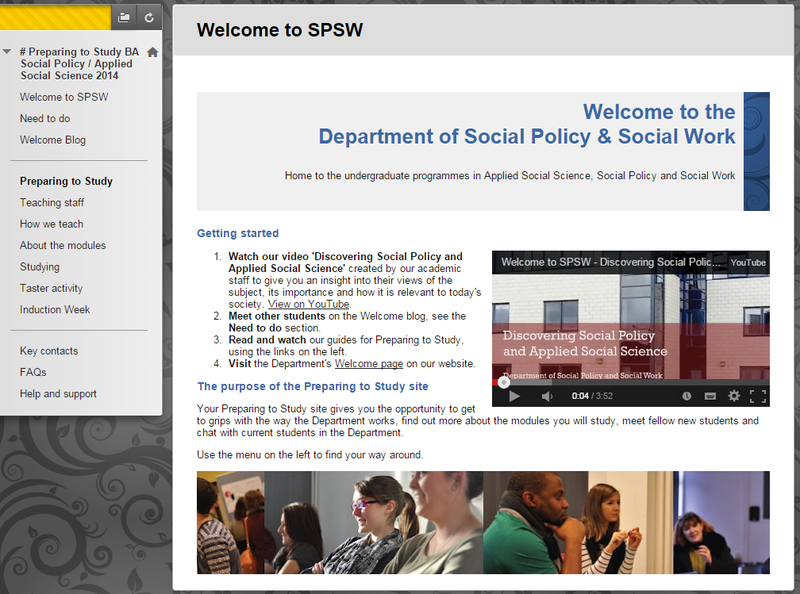 A permanent, ‘sticky’ announcement will be the first thing students see when they click into the site. 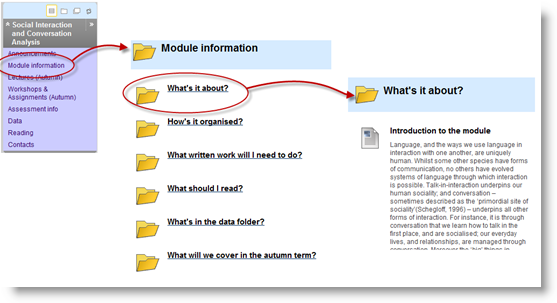 It could contain information such as the module aims and learning outcomes as well as information about the start of the module and where students should navigate to next. A ‘blank page’ content area is a single Item which can be populated with any content. Depending on your HTML ability, you can create visually appealing first pages that also provide sign-posting instructional guidance. The video below demonstrates both these approaches. The subsequent sections in this part of the Handbook go into more detail about how to construct a good site structure along with specific guides. Once you have an understanding of the principles, if you wish to focus on the technical training you can complete the online self-paced ‘Getting Started’ tutorial if you are new to using Yorkshare.